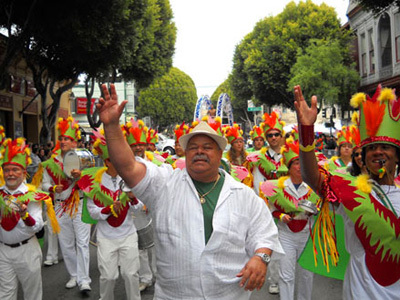 As a special treat this Carnaval season we have a very special guest – master Brazilian percussionist Jorge Alabê! Not only will he be making an appearance at our main Carnaval event on Saturday March 28th – he will be holding two percussion workshops with EEDS the week before Carnaval: Wednesday the 25th and Friday the 27th! This is a rare opportunity to learn from one of the best Brazilian percussionists in the US. You don’t have to be an EEDS member or student to attend class, and you don’t need to attend both classes. Instruments will be provided, and all levels are welcome, though the lesson will be geared to those with at least some experience. Description Platform for the exposure and exploration of authentic Candomblé w/with mestre drummer Jorge Alabe do Xango. Advance tickets: $40 for both days Or $25 per day. Please note: Participants must bring their own conga and drum sticks to class. To register please call 312-545-5034. This entry was posted in Carnaval 2015, Classes, Countdown, Event and tagged Jorge Alabe, Workshop by Evanston Escola de Samba. Bookmark the permalink.